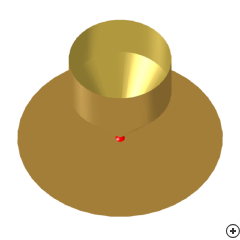 The monocone antenna (also known as a shell/solid conical monopole/unipole) is a monopole variation of the biconical antenna, therefore the monocone is a modified dipole shape. Dipole modifications are often used to obtain wide-band operation without greatly increasing complexity. Wide angle biconical antennas are popular for their wide impedance bandwidth and omnidirectional radiation coverage. The monocone variation may be preferred when the antenna is to be mounted on a metallic structure, or when radiation in only one half-space is required. A monocone is one half of a biconical antenna driven with respect to a large ground plane. The monocone differs from the discone primarily in the size of the ground plane. The monocone’s ground plane is relatively large in order to emulate an infinite ground plane, while the discone has a much smaller ground plane that influences antenna performance much more directly.